92 St Y, 1395 Lexington Avenue, New York, NY 10128. Panelists: Archie Rand, Richard McBee, Joel Silverstein. Silverstein have created paintings of contemporary Jewish Narratives. Their core subjects range from the Bible, Jewish commentaries, history, ritual, as well as contemporary Jewish life; all filtered through a modern and highly personal lens. will discuss the concepts that inspire them and their working process with specific examples, especially works currently on exhibition at the Congregation Kol Israel in Brooklyn, N.Y.
Spinoza in Our Time / Moderator: Ori Z. Soltes. Panelists: Lenore Mizrachi-Cohen, Goldie Gross, Judith Joseph, Cynthia Beth Rubin, Yona Verwer, David Wander. 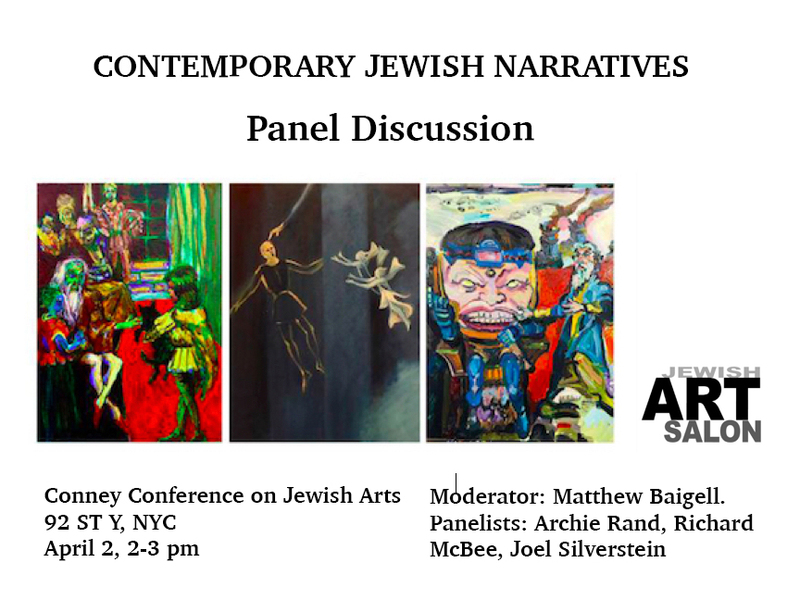 Anti-Semitism and Jewish Art Today / Moderator: Ruth Weisberg. Panelists: Yona Verwer, Phillip Schwartz, Max Kulchinsky, Richard McBee.